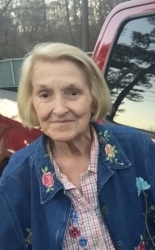 Mrs. Audrey Conkle Tuck, age 80 of Hampton passed away Thursday, November 8, 2018. Mrs. Tuck was born in Hampton, Georgia on July 2, 1938. She is preceded in death by her parents, Eugene Conkle and Annie Belle Conkle; siblings, Edna Hensler, Elsie Wallace, Ann Arendall, Robert Conkle, Thomas Conkle. Mrs. Tuck retired from the Federal Reserve Bank. She loved to spend time with her family, friends and attended Hampton First Baptist Church. Survivors include her husband, Marcus M. Tuck; siblings, Linda Parrish and husband Roy, Ellen Henderson, James Conkle, several nieces and nephews. Visitation for Mrs. Audrey Tuck will be Sunday, November 11, 2018 from 1:30 pm until 3:00 pm at Hampton First Baptist Church. Following the visitation, a funeral service will follow at 3:00 pm at Hampton First Baptist Church. Pastor Craig McAdams will officiate. Interment will follow at Berea Cemetery in Hampton.